A statistical look at Wednesday's Copa del Rey encounter reveals that the Dutch legend's club record of 26 free kicks has been equalled, and no prizes for guessing by who! 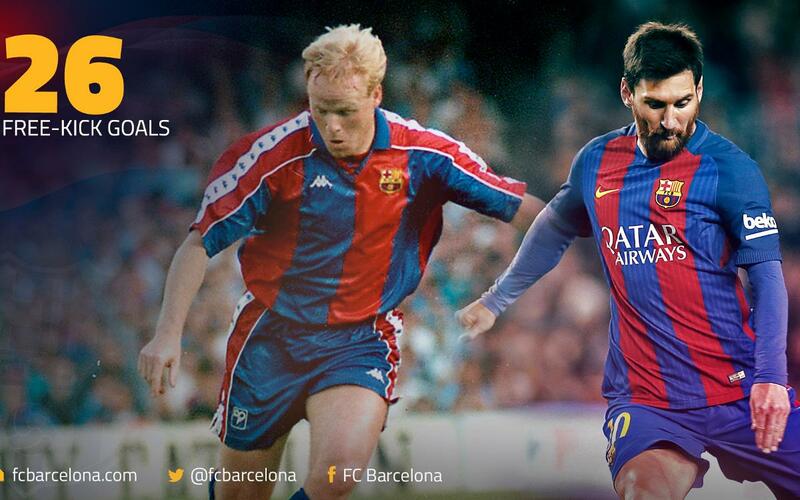 Leo Messi equals Ronald Koeman for free kicks. The Argentinian has scored pearls of free kicks in all three of Barça’s games in 2017, and in doing so has equalled the Dutch master as the club’s all-time free-kick king with 26. Gorka Iraizoz was on the receiving end for the fourth time on Wednesday, making the Basque keeper Messi’s number one victim. MSN magic: Since they’ve been playing together, the trident have now scored 302 goals between them. Luis Suárez got the goal that made it 300, but Neymar Jr and Messi also got on the scoresheet. Suárez races to first ton. The Uruguayan rammed home a peach of a volley to celebrate his first century of goals in a Barça shirt. It only took him 120 official outings to make that milestone, which is considerably quicker than any of Kluivert (202), Messi (188) or Stoichkov (186)..
Neymar Jr breaks his rut. The Brazilian had gone for 1,023 minutes without netting for the team, but stuck the penalty away with class against Athletic. But that has nothing to do with a lull in form – we are after all talking about the man who has made more assists than anyone else this season. Seventh quarters in a row. Barça haven’t made it into the last eight of the Spanish Cup on so many consecutive occasions since the run from 1951 to 1960, when they were in the quarters a massive ten times on the trot. More cup woe for Athletic. The Basques just can’t get it right against Barça in the cup. The teams have met nine times in the competition since 1960 and it’s the Catalans that have come out top every time. Fortress Camp Nou. That’s now fifteen home games in a row that Barça have gone unbeaten in the Copa del Rey. Since the 2012/13 semi-finals, they have gone for more three full seasons without suffering a cup loss at the Camp Nou.